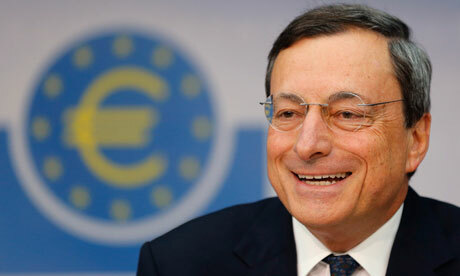 Mario Draghi, head of the European Central Bank. The end is nigh; the sky is falling. We're all doomed, doomed I tell ya. That was Wednesday night in Ireland. It was as if the end-times had arrived. It was a very strange 24-hours from Wednesday afternoon to yesterday afternoon. It all started with breathless reports on banking and Ireland's national debts from Irish reporters in Frankfurt. There were leaks and rumors: the Irish government had secured a deal on the bank debts that the state had absorbed. What that deal was, nobody could say exactly, but we had "a deal." Part of the deal involved the liquidation of the Irish Bank Resolution Corporation (IBRC), which was established by the government in 2011 as something of a banking hospice for the brokist, most bankrupt bank on the planet - Anglo-Irish Bank - and its little brother, another broke institution, the Irish Nationwide Building Society (INBS). Anglo is the Bank that Broke Ireland. So far, so good you might think. Well, maybe not for the 800 people employed by IBRC, but given how hated Anglo-Irish was there didn't seem to be a whole lot of sympathy for those people. As Wednesday evening turned into night that's when things started getting strange. The details of the deal were not forthcoming and then the noises from reporters with contacts "in Frankfurt" (that is, the European Central Bank - ECB) began to sound ominously like there was no deal after all. That's when the mood of television and radio reporters went from baffled to aghast as they found there were no answers to their questions. That's also when Irish tweeters went bananas. There was nothing on the debts, but the IBRC liquidation was going ahead. That required government involvement because everything had to be finished by 7am Thursday morning, although we weren't told why. In order to get that done the Dáil and Seanad (Ireland's lower and upper houses of parliament) would have to have a late, possibly all-night, session. We were also told that the President was cutting short his state visit to Italy so he could return to sign the bill into law on Thursday morning. It may not sound like the makings of a high drama, but it really was. All the frantic confusion evident in the government's rushing to get 50 pages of legislation drafted and passed by 7am Thursday sent Irish tweeters over the edge. In 140 characters Irish economists and banking experts - those who weren't pronouncing on our impending doom on television and radio - were conveying their skepticism and fatalism in equal measure. The rest of Ireland's tweeters joined in, often adding humor to the fatalism. #PromNight was soon trending in Ireland, a reference to the Anglo-Irish Bank promissory notes at the center of the whole national debt crisis. The sense that we were coming to an apocalypse was thanks to the similarity between Wednesday night and the night back in late 2008 when the parliament stayed late to approve the bank guarantee scheme that has led us to national bankruptcy and the loss of national sovereignty. Announcements from Taoiseach (Prime Minister) Enda Kenny were pushed back a few minutes. Then another few minutes. The whole thing had the feeling of a farce or, as people here presumed, a national tragedy. Eventually, around 11pm, Kenny and his government made their way to the Dáil where they expected to have a vote on the legislation - 50 pages of it - despite the fact nobody had yet read it. A short period of shambolic parliamentary proceedings ensued as the opposition parties sought some time to consider the bill. At this point cool economic discussion and political analysis on TV and radio was replaced with something akin to a desperate moment of national prayer. "Please God, don't let them make things any worse." The tweeting was even more desperate. When the discussion of the legislation finally got going - around midnight - it was a welcome relief. The endless droning of politicians didn't make anyone feel better, but at least they put us to sleep. We'd have to wait til morning to find out if the verdict was death. Or worse. Thursday morning things were calmer. Maybe it was simply that the sun had risen on a new day that provided that glimmer of hope, but the fact that we learned that the bill was passed by both houses and signed by the President after his mad dash home from Italy was at least certainty. That calm gave way to even more hope as rumors of an ECB deal again began to circulate. The strangeness returned around lunchtime when Mario Draghi, head of the ECB was asked about the deal during his regular press conference. His response: We "took note" of the Irish actions. "Took note." And with that commentators were baffled again and twitter was aflame. A collective "I knew it! We are screwed" was the general theme. A few other journalists at the press conference asked for more clarity, but Draghi remained indecipherable. We only had a short while to wait, however. At 2:30 the Taoiseach rose again in the Dáil to announce that we did, in fact, have a deal with the ECB. Amen. Calm has been restored, although nobody seems too clear as to whether (a) the legislation rushed through on Wednesday night is actually constitutional or (b) the deal on the debts that we got was all that great. For many people the fact that we have removed any doubt about whether the state was going to repay Anglo's debts makes this deal a bad one. I have sympathy with that view, but that ship sailed a long time ago. There are virtually no bondholders left. The debt now is to the ECB and there was no way we were going to renege on that. The deal may not be great, but it's better than we had. The total debt will not be paid off til 2053, which makes it more like war reparations than bank debt, but so be it. The state wrongly guaranteed those loans and now we have to pay. The new deal makes it a bit more affordable and pushes back the pain enough so that we can at least hope that with a bit of luck and a bit of inflation and economic growth the debt will seem less significant than it was last week. We're still sick, but it's a chronic rather than terminal illness. That's progress.